India’s leading VAS provider Hungama Mobile launches an exciting service that enables viewers to get archived mobisodes of ‘Koffee with Karan’ Season 3 on their mobile phone anytime, anywhere. Presently the service has launched with various mobile service providers, including Reliance Mobile (GSM & CDMA), Vodafone and Tata Indicom. To get the archived mobisodes, users need to follow a simple four step process: 1. Dial 5464646 2. Select the option 3. Archived Mobisodes start playing with On-Demand option to the customer to skip to next mobisode at any point of time 4. Once the call is over, the cost is deducted from the subscriber’s account at Rs.3 per minute consumers access to fun and entertaining content on their mobile phones. 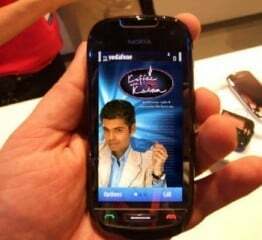 Hungama Mobile is also giving consumers an opportunity to take part in the ‘Koffee with Karan’ rapid fire round on mobile. Lucky winners of this mobile rapid fire will win the coveted ‘Koffee with Karan’ gift hamper. Consumers simply need to answer eight questions in 5 rounds each. Each correct answer comes with 5 points. Users can play the quiz as many times as they wish; the more they play, more are the chances to win ‘Koffee with Karan’ hamper. With an exclusive guest list, the show goes beyond the glitterati of B-town. This season, ‘Koffee with Karan’ unveils the closely guarded secrets of the most sought after celebrities. Consumers can now catch up on missed episodes and revisit their favorite episodes directly from their mobile phones. these mob operatrs r forcefully charging us to pay on vas even if v dont gv our consent. trai plz do sumthng n penalise them.